A Room of One's Own is held together not as in her other works by a thread of feeling, but by a thread of argument - a simple well stated argument:	the disabilties of women are social and economic; the woman writer can only survive despite great difficulties and despite the prejudice and the economic selfishness of men; and the key to emancipation is to be found through the door of a room which a woman can call her own and which she can inhabit with the same freedom as her brothers. The lack of this economic freedom breeds resentment, the noisy assertive resentment of the male, who insists on claiming his superiority, and the shrill nagging resentment of the female who clamours for her rights. Both produce bad literature, for literature - fiction that is - demands a comprehensive sympathy which trancends and comprehends the feelings of both sexes. The great artist is androgenous. 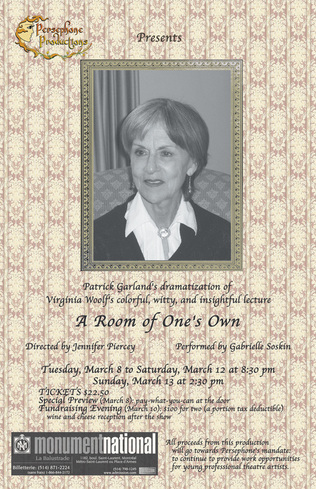 A Room of One's Own grew out of a lecture that Virginia Woolf had been invited to give at Girton College, Cambridge in 1928. Ranging over Jane Austen and Charlotte Brontë and why neither of them could have written War and Peace, over the silent fate of Shakespeare's gifted (and imaginary) sister, over the effects of poverty and chastity on female creativity, she gives us one of the greatest polemics of the century.